What will my administrative office say if I ask them to handle all this? Turn for help to AUSTROPA INTERCONVENTION. Let us assume you are organizing an event, and you have reached the point of needing to deal with travel, hotel reservations, opera tickets, transfers, perhaps a few attractive excursions or the ideal location for a gala dinner, and it’s conceivable that one or the other guest may also have special needs when it comes to food. 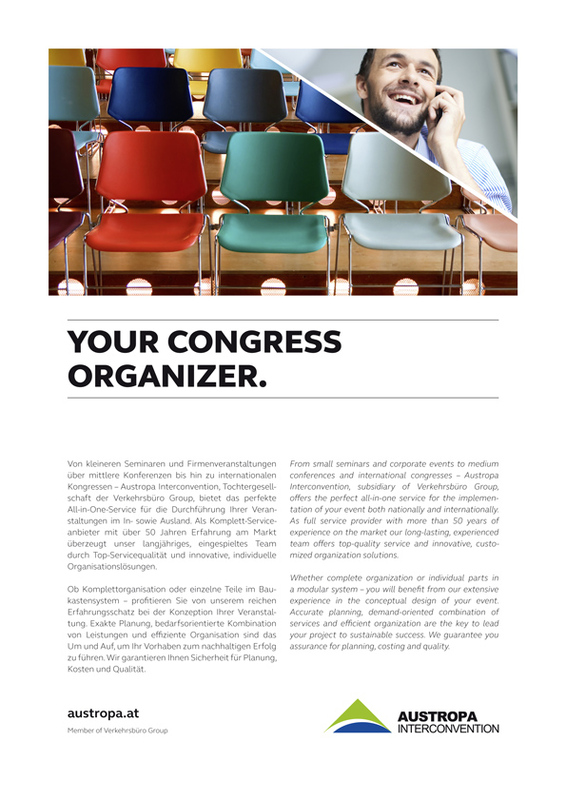 If you or your administrative office were the contact person for all this, you would scarcely have time to take care of the scientific aspects or content of your congress – and that is after all the most important part. Here you can find out about the services that we as a DMC “Destination Management Company” can offer you – in some cases at no additional cost to you, the organizer. Making arrangements for technology, musicians, decorations, photographer etc. Ordering tour guides, tours, buses, restaurants etc. Ordering tickets for opera, concert, theatre, musical etc. 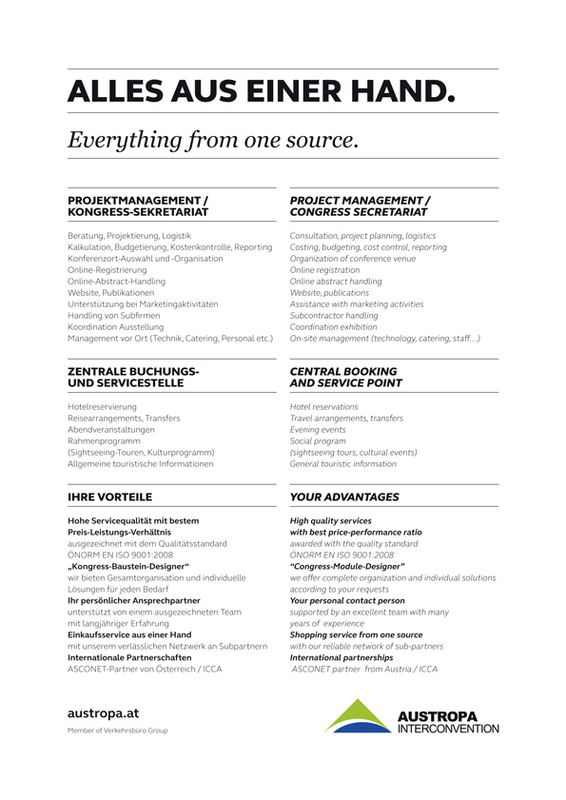 For each project, you have just one contact person who organizes everything for you. With the support of an outstanding team. There’s no need for you to slave away over the special requests of individual attendees. Or over ideas for floral decorations at the gala dinner, the right seating or music. We will do all that for you. Even though people always think of mountains, Mozartkugel chocolates or St. Stephen’s Cathedral when they think of Austria – you can offer your congress attendees far more than just a pale imitation of the usual guidebooks. With the right partners and the expertise of our staff, you can be certain that your congress will be a success all round. As the top company in the area, we can always offer you especially good conditions without compromising quality. The preferences and wishes of your attendees are always our top priority. We organize everything. From concert tickets, excursions, tips for a free afternoon. A drive out into the country, and much more. Your attendees will find all they need to know about their arrival, public transport, banks, emergency numbers, shopping tips, weather, etc. on our information pages. The following terms are naturally just a guideline, as every congress is organized separately and in line with the client’s requirements. We shall be happy to prepare you a specific offer based on your requirements. There is absolutely no charge for our room reservation service, since our organizational and administrative costs are covered by hotel commissions. The organization fee (starting at 10 % or set fee) is based on the scope and size of the event. For example gala dinner for 200 people at the Palais Ferstel: The total costs for renting the palace, aperitif, three-course gala dinner, beverage package, menu cards, flower arrangement, background music, signage, cloakroom and organizational fee come to approx. € 22.000,–. Hostesses – for reception and information stands from € 24,–/hour, minimum 4 hours. All prices are exclusive of 10% or 20% VAT.